On the land side of the Elysee Beach Hotel is to be found the Circuit Zandvoort Racing Track which has in its time been well-known way beyond beyond the borders of the Netherlands. 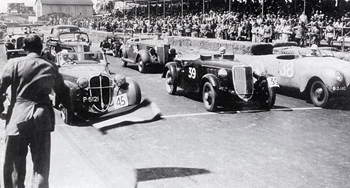 It was way back in the 1930s that car racing first began on a designated track in Zandvoort and for the first time in Dutch history in the summer of 1939 an international competition was organised for racing cars. At that time the race would of been through the streets of Zandvoort and would probably have been enjoyed by a few thousand fans. After this, the Zandvoort authorities made the decision that there would be a permanent circuit and the location chosen was to the North of the village in the dunes. Naturally due to the outbreak of World War II and the occupation of the Netherlands by the Germans, things didn’t proceed as quickly as would have been expected. However, the community purchased 112 hectares of duneland and a track of about 4 kilometres in length was able to be realized. This earthen track was laid in 1941, and in 1946 the surface was hardened with the addition of a thick layer of war rubble. Finally, in 1948, it was asphalted, and on 7 August 1948 the opening event took place, organized by the British Racing Drivers Club and a lot of Formula 1 drivers came to Zandvoort even though at that time the race did not count for the championships. The winner of this first race was Prince Bira of Siam. In the next year the race was given a new name: ‘‘de Grote Prijs van Nederland’’ and it was won by Ferrari’s driver Luigi Villoresi. Dries van der Lof (l) Maserak 250F from 1956 during Historic Grand Prix Formula I in Zandvoort. In the 1950s the Zandvoort circuit did actually become part of the World Championships and the title up for grabs was changed to ‘‘de Grote Prijs van Nederland’’. In the 1960s the drivers fighting for the championship were men later to become legendary in the sport such as Graham Hill, Jackie Stewart, Jack Brabham and Jim Clark. All of these would very likely have raced on the Zandvoort circuit. In 1970, the tragic death of the British racing driver Piers Courage cast a shadow over the Zandvoort circuit when his car ran off the track and up a dune then burst into flames and disintegrated and only three years later, Roger Williamson also had a fatal crash when his car came to rest upside down and burst into flames at exactly the same spot — the Tunnel Oost bump — where Courage’s accident had started. After these events Formula One racing was to stay away from the Zandvoort circuit until 1974 when the race was won by Nicky Lauda. In the years to come, the race would be won by more celebrated drivers including Alain Prost, Nelson Piquet, and Didier Pironi but it turned out that the last formula 1 Grand Prix to be held in the Netherlands was on 25 August 1985 with the race eventually being won by Nicky Lauda with Alain Prost second and Ayrton Senna in third place. With the building of the bungalow Park nearby and also due to financial restrictions, in 1988 it was decided to shorten the circuit as it seemed at this would be the only way that it could usefully continue. 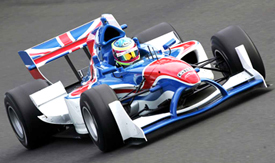 Soon after the Marlboro Masters came about and many formula 3 drivers were invited to take part many of whom eventually became Formula One winners i.e. David Coulthard and Pedro Lamy and more recently world champion Lewis Hamilton. 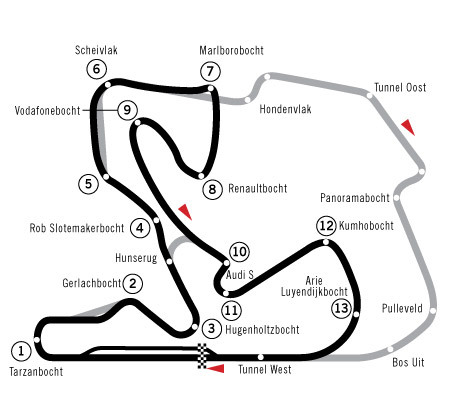 The most well-known corner in the circuit is Tarzanbocht and it can be said that the circuit probably gained much of its popularity due to the nature of its fast, sweeping corners such as the aforementioned “Tarzanbocht” (Tarzan corner) which is at the end of the start/finish straight. Owing to the fact that there is a camber in the corner, it provides excellent opportunities are overtaking. Tarzanbocht corner is reputedly named after a local man nicknamed Tarzan who insisted that he would only give up his vegetable garden in the dunes if the track’s designers named a nearby corner after him. However, this is only one theory of many! If you’re coming by car then you can simply enter this address into your satnav system: Bugermeester van Alphenstraat 108, 2041 KP in fact the street name should be all you need. You will find the main entrance to Circuit Park Zandvoort directly on the street. 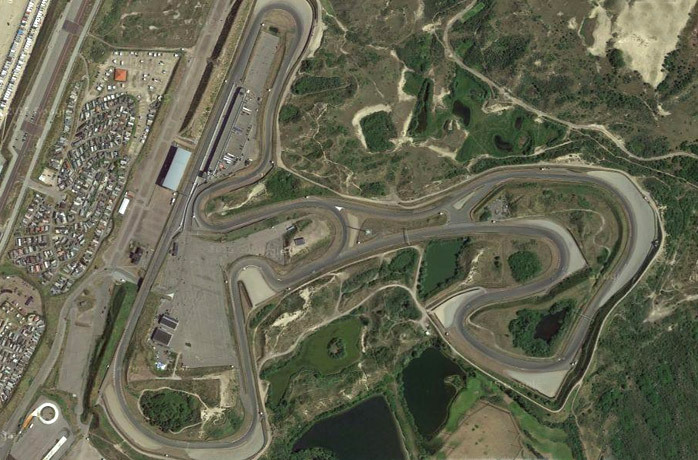 Circuit Park Zandvoort has various parking areas which can accommodate a few thousand cars. Most of the time you will have to pay for your parking. If the car parking is full at the circuit then you may be to Park nearby on the Boulevard Barnaart. Do bear in mind that if it’s a sunny day then Zandvoort will be extremely busy so you must allow extra time for parking. It’s really easy to get to Zandvoort by train with direct connections from Amsterdam Haarlem and Den Haag and the Circuit Park Zandvoort is literally only a 10 minute walk from Zandvoort station. As you leave the station, you need to turn right and go in the direction of Van Speijkstraat. At the end of the road, crossover passing the gas station and follow the road over Burgermeester van Alphenstraat. Continue about 500m, and you will find the main entrance of the Circuit on the right hand side. You can also choose to travel to the circuit by bus. From the centre of zandvoort is a frequent service to Circuit Park Zandvoort, But also there are direct connections to Amsterdam and NS Station Haarlem-Spaarnwoude utilising bus number 80. This particular bus 80 stops close to the main entrance of Circuit Park Zandvoort.